Chris Newsome took the following image of Fragment C of Comet 73P Schwassmann-Wachmann on the night of the 11th - 12th May 2006. The open cluster NGC 6940 in Cygnus can also be seen in the upper left portion of the picture. The image is comprised of 20 frames of 150 seconds each taken with a Canon EOS300D camera at 200 ASA through a Skywatcher 80T refractor over a period of 56 minutes. The setup was guided by a Meade DSI and a Celestron C8-NGT using MaximDL. The setup had not been drift aligned hence the rotation effect of the stars on the left of the image. 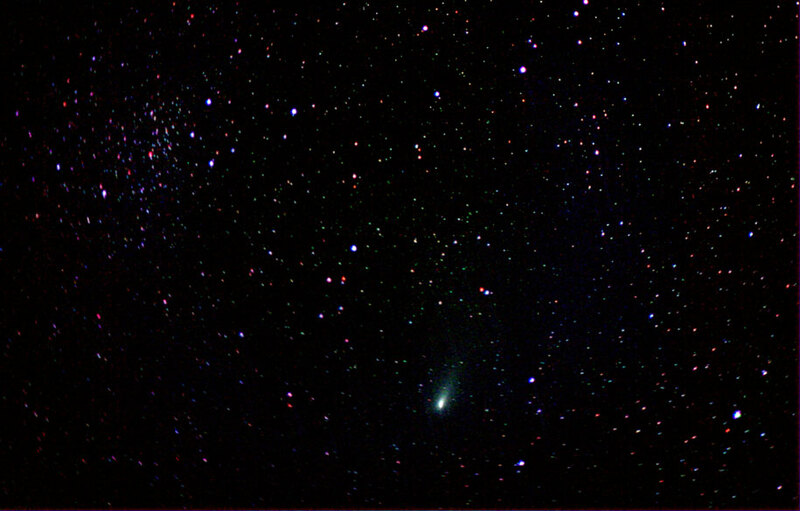 The frames were dark and bias calibrated in MaximDL and then two separate combines were done on the images, firstly stacking on the star background and then the second was stacked on the coma of the comet. 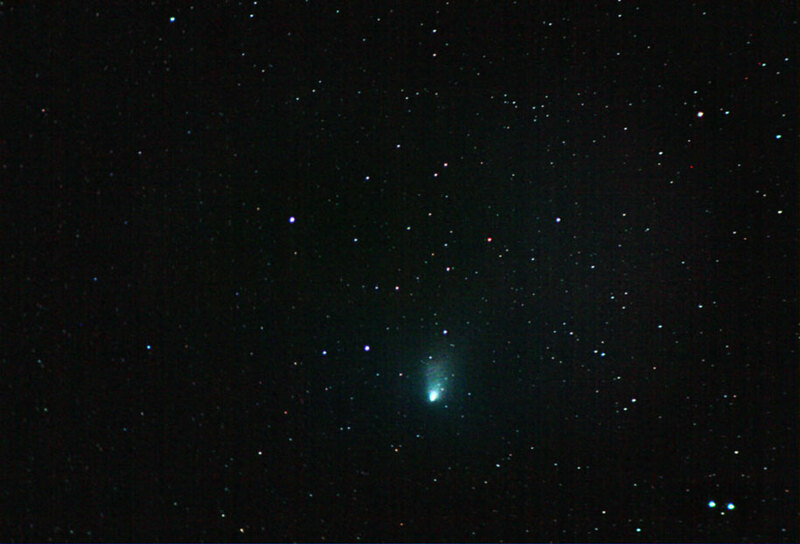 These two images were then layered and cropped to produce an exact tracing and each layer was then processed in the usual manner using RGB levels and Curves before being 'glued' together to form the final picture of a stationary comet against a stationary background. Click here to view a 133KB MPEG video of these frames showing the comet moving across the sky background. The animation only lasts a few seconds but covers a period of 56 minutes. At the time the comet was moving rapidly as it neared the Earth for a close encounter of 6 million miles during the week commencing 13th May 2006. The processing was done in Photoshop CS2 and then each frame was converted to an AVI in MaximDL before being further converted to MPEG format. To keep the size of the animation down to a manageable level, the processing has meant that the full extent of the coma and tail of the comet has had to be sacrificed somewhat to show the movement. 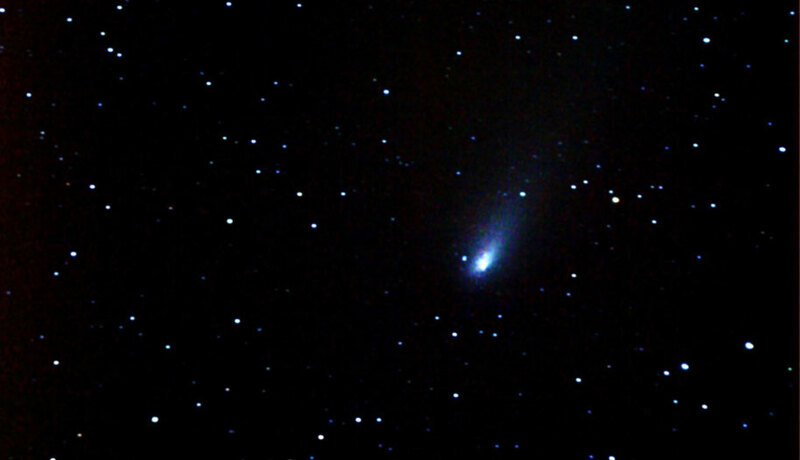 The following image shows Fragment B of Comet 73P Schwassmann-Wachmann as it appeared on the morning of the 10th May 2006. 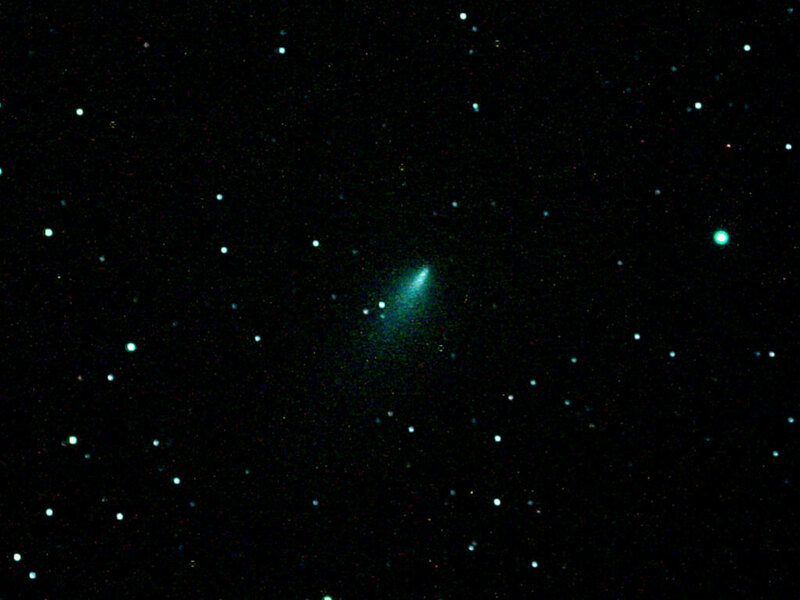 It was reported later in the day on the SPA website that the fragment had dramatically increased in brightness and was now at about 5th magnitude, brighter than Fragment C. The image was taken by Chris Newsome using a Canon EOS300D camera through a Skywatcher 80T refractor with an Astronomik CLS filter attached. This was autoguided with a Meade DSI through a Celestron C8-NGT on a CG5-ASGT mount via a GPUSB autoguider interface, using MaximDL software. Ten images of 180 seconds each at 200 ASA were taken. The ten images were then combined twice (in MaximDL), firstly centering on a star to produce a static background. This had the effect of obliterating the comet due to the fact that it had moved a considerable distance in the half hour it took to take the sequence of images. The same ten images were then combined again, this time centering on the comet's head which had the opposite effect (it obliterated the star background). The resulting two images were then processed separately in CS2 using GradientXTerminator, RGB Levels and curves. The two frames were then overlayed on each other, again in CS2 using a color-dodge matching to produce a single frame. The layers were flattened and the final image converted to JPG format from TIFF. Chris expresses many thanks to Adrian Brown who helped adjusting the settings on the ASGT mount and assisted in the lessons on how to autoguide. Without his help the image would not have been possible! 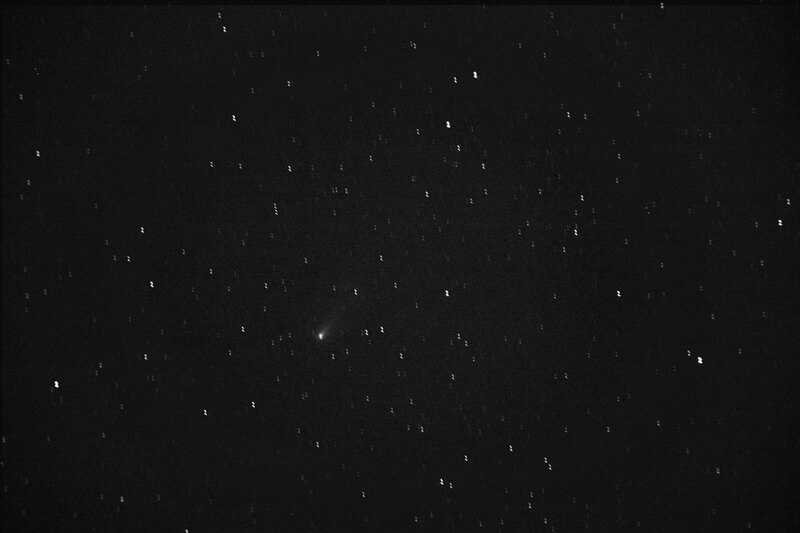 The following image of Fragment C of Comet 73P Schwassmann-Wachmann was taken by Adrian Brown at around 1 am on the 6th May 2006. The image is comprised of six 5 minute exposures. Adrian used a Skywatcher 80ED refractor @F7.5 and an ATK16HR CCD camera. Image stacking and processing was done in Maxim DL. Adrian set an autoguider to track the comet nucleus instead of one of the background stars and it has worked very well. Chris Newsome took the following image of Fragment C of Comet 73P Schwassmann-Wachmann on the 5th May 2006. Chris used a Canon EOS300D camera with a light pollution filter at the prime focus of a Skywatcher 80T refractor piggybacked on a C8-NGT mount. Only two exposures (120 seconds at 200ASA) were usable as there was a lot of cloud around at the time of the imaging sequence. Each of the frames were calibrated in MaximDL but due to the fact that Maxim needs a minimum of three frames to do a combine, Chris just overlayed each of the frames as separate layers in CS2 and then processed each in the usual manner using curves and RGB levels to achieve what he terms a 'semi-decent result'. The dual layer image was then converted to greyscale which automatically merged the two into one and then a final bit of tweaking was done on the resulting image before saving it as a JPEG file. 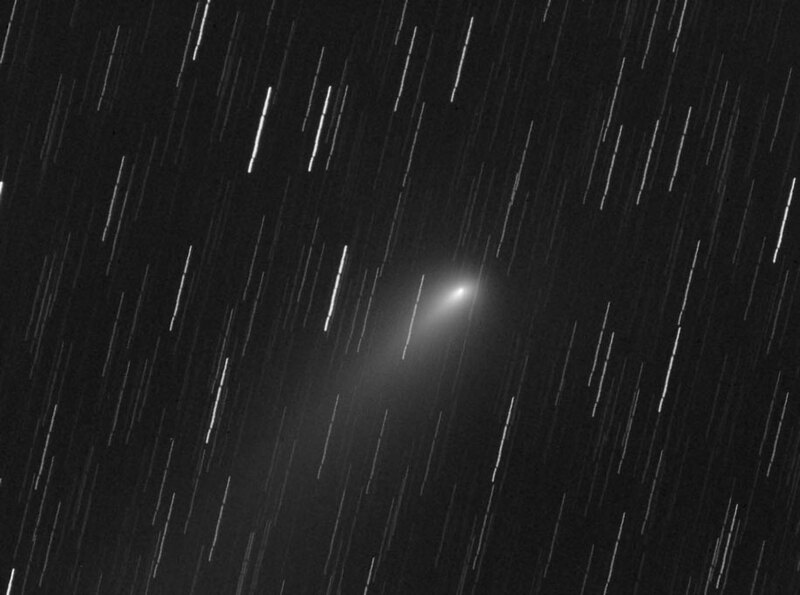 The following image of Fragment C of Comet 73P Schwassmann-Wachmann was taken by Chris Newsome on the 5th May 2006 at the prime focus of his new Celestron C8 NGT telescope. Chris used Canon EOS300D camera, taking 5 frames of 60 seconds each at 200ASA. The frames were calibrated and combined in MaximDL and then processed in CS2. The overall image is very blue in colour due to the fact that it was taken without a sky pollution filter and when processed to remove the sodium colour, the complimentary colour of blue is left. Chris Newsome took the following image of Fragment C of Comet 73P Schwassmann-Wachmann (seen to the left of the image) on the 1st May 2006 using a Skywatcher 80T refractor and Canon EOS 300D camera on a CG-4 mount. 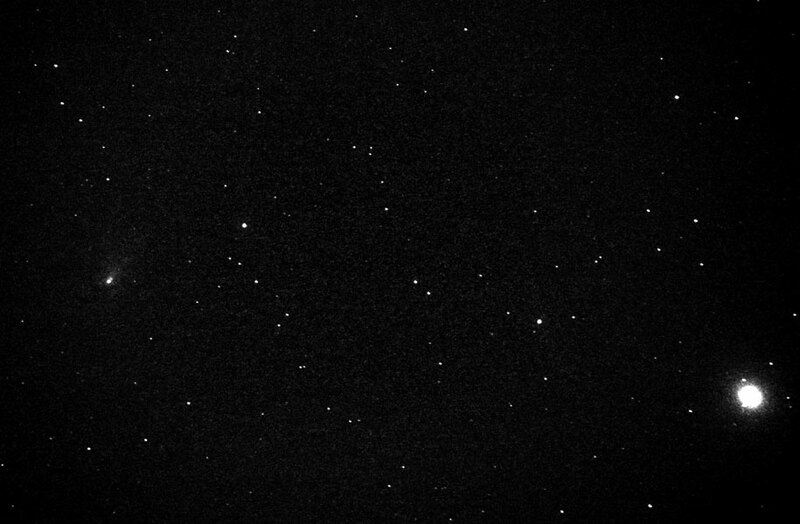 Three 60 second images were taken at 800ASA, calibrated and combined in MaximDL. They were then processed in CS2 using RGB levels and curves converted to greyscale. The star to the right of the image is Zeta Herculis. The following image shows fragment B of Comet 73P Schwassmann-Wachmann and was taken by Chris Newsome and Adrian Brown on the on 16th April 2006. They used an Orion 80ED refractor on a CGE mount with a Canon EOS300D camera filtered with an Astronomik CLS filter. The setup was guided using a Skywatcher 80T with an ATIK CCD camera. Four images, of 10 minutes each, at 400ASA were calibrated in Maxim DL and then processed in PS/CS2 using GradientXTerminator, RGB Levels and Curves. Upon closer examination it appears that this fragment is splitting further as multiple centers of brightness are visible in the nucleus. This may be one of the first observations in the world of this particular comet fragment splitting further - and by DDAS members!